Happy Tuesday everyone! I hope this week hasn’t been to stressful for those of you with school age kids getting them back into a morning routine again and out the door on time! My 4 year old started last week and loves it but she isn’t such a fan or being woken up at 7:30am each morning. 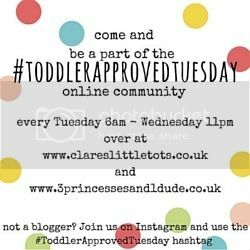 We’re back with another #ToddlerApprovedTuesday linky and this week we’re on time so you can get your toddler posts linked up and join in the community. This week we’re excited to announce that we’re co-hosting the Weekly Virtual Book Club for Kids and are kicking off the first week with these Finger Painted Apple Trees to accompany this weeks featured book – Ten Apples Up On Top by Dr. Seuss. Next week I’ll be showcasing my two favourite posts with you so don’t forget to follow the rules below. Tweet us (@clarestots and @3princess_1dude) for a Retweet. If your post as a pinball image I will pin to the #ToddlerApprovedTuesday Pinterest board.